Meanwhile, Holmes is pulled by two old friends and a distant relation into the growing war between France, Spain, and the Rif Revolt led by Emir Abd el-Krim --- who may be a Robin Hood or a power mad tribesman. The shadows of war are drawing over the ancient city of Fez, and Holmes badly wants the wisdom and courage of his wife, whom he’s learned, to his horror, has gone missing. 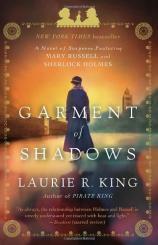 As Holmes searches for her, and Russell searches for herself, each tries to crack deadly parallel puzzles before it’s too late for them, for Africa, and for the peace of Europe.